When life gives you lemons, make lemonade. Or, in my case, when life gives you aperitif wine, make cocktails. You see, I had bought a bottle of Cocchi Aperitivo Americano, an Italian aperitif wine, for a recipe that ended up being less than stellar. I had only used a 1/4 cup and had no idea what to do with the rest of the bottle. So, I went in search of another recipe that might use that wine. It turns out there are very few recipes that do. However, I did find one promising one for a Cocchi and Prosecco cocktail. As luck would have it, soon after finding the recipe, a group of moms I get together with occasionally was having another get together. I offered to make cocktails. They were extremely easy to make and everyone loved them. Although the orange twist seems like a small addition, I think it does contribute to the overall flavor of the drink. I recommend not skipping it. Making orange twists is not as complicated as you may think. And you don’t have to have any special tools to do it. I just used a very sharp vegetable peeler, knife and a skewer to make mine. First, thoroughly wash and dry your oranges. Then, use the vegetable peeler to remove a wide strip of zest from the center of the orange with as little of the pith as possible. I find that resting my thumb on the orange and using a small sawing motion while moving the peeler towards me (rather than away from me) helps. You want a strip that is about 1 inch wide and 4-5 inches long. It is OK if the strip is longer since you can trim any excess if you want. Lay the wide strip of zest on a cutting board, then use a knife to trim away the rough edges. Cut the strip into several thin strips about 1/8 inch wide. Take one thin strip and wrap it tightly around a skewer. Hold the strip of zest on the skewer for a few seconds then drop the twist into your drink. Cheers! 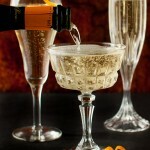 Stir sugar and chilled Cocchi Aperitivo Americano together in a champagne flute until sugar is slightly dissolved. Add Prosecco and garnish with an orange twist.